Deepend’s head of strategy, Amer Iqbal told AdNews: "Mobile devices are really becoming the only personalised device.” He said: “When you think about other screens like laptops for example, they're becoming more communal devices. When it comes to advertising, Iqbal said that these insights allow advertisers to make everything more contextual. The white paper is available to the public as a download via the agency’s website. The study surveyed 1,500 Australian adults who own either a smartphone or tablet device. The sample was adjusted to represent the Australian population using ABS data. Twitter in the bedroom, shopping on the loo: How do you use your mobile? Ever wonder what Australians are doing late at night in bedrooms around Australia? Well, turns out Tweeting is the answer. We're also online shopping on the toilet. 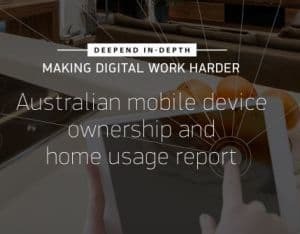 That is according to a white paper released by independent digital communication agency Deepend aimed to better understand how Australians are using their mobile and tablet devices in the home. Some of the findings from The Australian Mobile Device Ownership and Home Usage Report we know already, such as our mobile phones are permanently attached to us regardless of the room, we always have them with us, but others were more revealing. The report produced some surprises such as paying bills is most common in the nursery in the early evening with 24% of respondents saying they do so. Between lunch and early evening more than a fifth (22%) of respondents said they were shopping online while in the bathroom compared to 16% in the lounge at the same time of day.